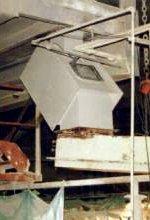 Measurement of finished cement mill coarse returns. Custom designed to suit clients inlet chute. Removable side plates for maintenance access. Capacity 50 tonnes per hour (unit shown) but installed up to 450 tonnes per hour elsewhere for same application.